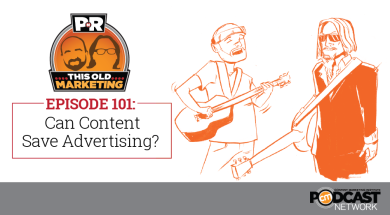 In this week’s episode of #ThisOldMarketing, Robert and I discuss whether content marketing can really save advertising – and whether it actually needs to be saved. Next, we admire Mitch Joel’s take on the state of blogging, but consider the forces affecting it to be evolutionary, rather than the end of blogging as we know it. Finally, we discuss what’s happening in the world of mega-agencies – a senior Pepsi executive contends they are threatened by clients reducing the number of agencies they work with and by the rise of content marketing. Rants and raves include some questionable content marketing stats and a brilliant native advertisement from LexCorp. We wrap up the show with a #ThisOldMarketing example from Westinghouse. Can content save advertising? (8:11) What used to be regarded as one of the most skippable forms of advertising — custom content — is now being held up by many in the industry as the thing that just might save advertising from all manner of ad-avoidance behavior, including ad skipping and ad blocking, says Ad Age. This is another article that incorrectly lumps content marketing together with advertorials, native advertising, and branded content. It also treats web page traffic and social sharing as if they are the only important measures of engagement. Robert believes advertising doesn’t need to be “saved.” It’s evolving into something new. Is this the end of blogging? (17:37) In a thought-provoking blog post, Mitch Joel points out that it’s getting harder to lure readers from social channels and content aggregation sites to his excellent blog. As a result, he is starting to experiment with Facebook Notes and other channels to publish his content. Robert believes Joel’s thought-provoking argument may be the best answer for bloggers, but not for brands. I believe even well-known bloggers need to build a subscribed audience in order to survive. PepsiCo executive says agency model is going to break (30:34): The advertising agency model is under threat as big marketers make serious cuts in the number of agencies they work with, fight for better prices, and invest in video outside of the traditional confines of television. So says Bradley Jakeman, president of PepsiCo’s global beverage group. He is also “absolutely baffled” that large advertising holding companies seem to be ignoring opportunities to purchase talented content producers. Robert and I agree that such acquisitions are starting to happen, but they don’t seem to be on the radar of big media covering advertising and large ad agencies. 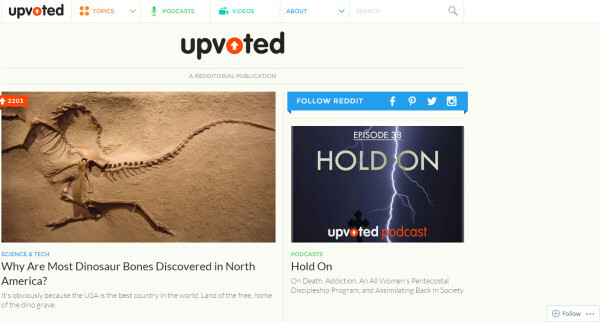 Joe’s rant and rave: I love Upvoted, a new publication launched by Reddit, which contains a diverse collection of original content created by the social channel’s staff. I think it’s an excellent move to further engage its already passionate community. There’s just one downside, which I outline in the podcast. I also want to call attention to new research from Forrester, which says 47% of companies have raised their content marketing budgets by 20% or more. That data doesn’t align with CMI’s latest benchmark survey. When I dug deeper, I discovered that the Forrester study was based on only 86 survey respondents – not very statistically accurate. Robert’s rave and rant: Robert is a huge fan of Superman. He is thrilled with a new native ad on Fortune that profiles the Man of Steel’s arch enemy, Lex Luthor, Jr. It describes LexCorp’s pivot into technology and Lex Jr.’s role in its transformation. A banner ad on the page takes you to a slick website for the faux company. It’s a great experience, but Robert identified several ways it could have been made even better. Robert’s rant: A new report from Aberdeen Group that says marketers who utilize data and analytics in their content marketing are seeing five times as much revenue as those who don’t. It’s a decent report, but it could have been so much better, he laments. Westinghouse: Radio broadcasting in the United States started with the Westinghouse Company. The company asked Frank Conrad, one of its engineers, to start broadcasting music while they would sell radios to pay for the new service. Westinghouse applied for a commercial radio license and started KDKA, the first government-licensed radio station, in 1920. In 1921, there were six licensed radio stations; by the following year, that number had quintupled to 30. 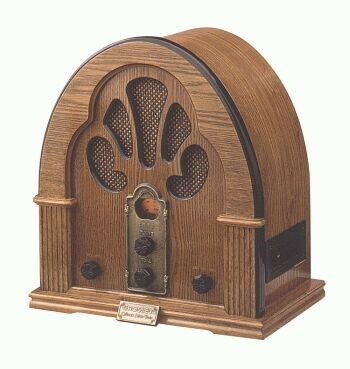 In 1923, there were 556 radio stations. What’s remarkable is that Westinghouse realized that it needed to increase adoption of radio receivers for this new industry to be a success. That’s why early advertising focused on helping the company sell more radios, not to promote advertisers’ products (today’s predominant business model). Likewise, radio shows (content) were created to provide an engaging experience, which also helped drive the growth of this new form of media. This approach to evangelizing a new type of communication medium makes Westinghouse an excellent example of #ThisOldMarketing.